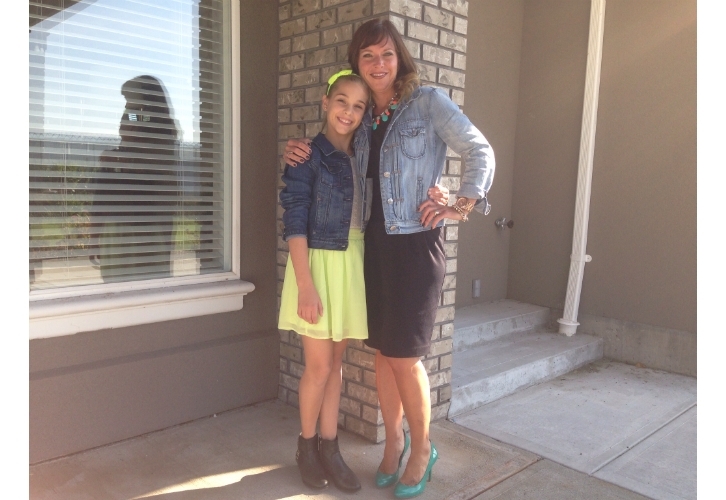 Mini Me ~ Skirt, Jean Jacket and Neon! We were leaving the house for church Sunday morning, when Dylan and I looked at each other and realized we were dressed quite similar!! Now, Dylan had cycled through a few…well, a number of outfits before she settled on what she was actually going to wear….ok, I had nixed a few of her ensembles…one was too casual for church, another outfit had the required skinnies in the wash….but I was quite happy with her final decision!! I thought she looked pretty cute! Oh, the joys of being a tween!! So, the similarities were this….we both were wearing skirts, we both had denim jackets and we both added a pop of neon! A basic black pencil skirt and a black tee are serious musts in your wardrobe. My girls actually thought I was wearing a black dress! You can combine these two pieces will other fun pieces from your closet to create tons of different looks from casual to dressy! I dressed down basic black with a fun necklace with neon “chicklets”, colorful pumps and a jean jacket with rolled up sleeves. Just a quick note about something I’m super excited about. You can now buy JoeFresh online!!! And shipping is free on orders over $50. They offer a huge selection of pieces online…and their prices are great! Photo creds to Berkeley…hey, she just asked for a camera for Christmas….hmmmmmm, this could come in handy!